Online hockey betting can be pretty confusing at first. Canadians like us know that the Proline V and H is simple to understand (although it gets a bit complicated once they throw the V+ and H+ at you, or football games that are decided by 3 points are somehow a tie). When you log onto a online sportsbook and see things like alternate lines, exotic wagers or grand salamis, it can get intimidating pretty quickly. Even if you’ve been doing online NHL betting for a while, there are probably some NHL betting terms that you don’t totally understand. Things like sharp money, vigorish, Kelly Criterion, reverse line movement… you’ll be a better bettor if you know what those things all mean. We’ll try to explain it all in this hockey betting glossary. We’ll start off with an explanation of the different NHL betting odds and then get into the various NHL betting terms. 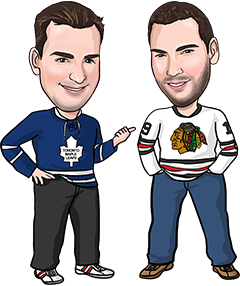 If there are still some hockey betting terms or concepts that we didn’t explain here, shoot us an email and we’ll try to answer your question and add it to our glossary as well. Puck Line (Spread): A handicap that requires the favourite to win the game by more than 1 goal, or the underdog to not lose by more than 1 goal. Total (Over/Under): When oddsmakers set a total number of goals that might be scored in the game and then you bet under or over that number. Live Betting: Betting on a game while it is in progress. Live betting odds adjust throughout the game. Period Betting: Betting on the result of a period, not the full game. Alternate Lines: Betting lines that differ from the regular money line, puck line and total, usually at inflated odds. If the puck line is -1.5 +150, the alternate puck line might be -2.5 +350. Props: Betting on things that happen within the game, instead of the result of the game itself. Examples are whether Alex Ovechkin will score a goal or whether Carey Price will make more than 30 saves. For more details, check out our article on where and how to bet NHL props. Exotic Wager: Any bet other than a straight bet or parlay. Parlay: A bet in which two or more outcomes are combined, similar to Proline and other provincial sports lotteries. Futures: Odds on a event that will take place in the future, not tonight’s game. NHL futures odds include Stanley Cup betting odds, division championship odds, Art Ross Trophy odds, etc. Double Chance: A bet offered by some NHL sportsbooks in which you will win your bet if your team wins or ties. The odds will be greatly reduced on a double chance bet, since your probability of winning is much higher. Team Total: Betting over or under the amount of goals a team will score in a game. Grand Salami: An over/under bet on the amount of goals that will be scored that night in the NHL. Favourite: The team that is most likely to win, according to the odds. Underdog: The team that is least likely to win, according to the odds. Chalk: Another word for favourite. Reduced Juice: When a sportsbook’s juice (commission or vigorish) is less than the industry standard. Pinnacle Sports is a reduced juice NHL sportsbook because they offer -105 odds structure, instead of -110. To see how that is better than a sportsbook bonus, visit our Pinnacle Sports review. Dime Line: When the difference in juice between odds on each side of a bet is 10 “cents”. For example, -120 and +110. Sharp Money: Slang for who the experts are betting on. If there is sharp money on the Canucks, it means professional bettors and respected handicappers are betting a lot on them. Hedge: Betting the other side of a previous bet, often to guarantee a profit. For example, if you have the Canadiens +1000 to win the Stanley Cup and they make the final, you could hedge your bet by placing a bet against them at even odds. ROI: Return on Investment. It’s a way of determining how much money you are winning per dollar wagered. 2-3% is a terrific ROI in sports betting. Edge: The advantage you believe you have on a wager. If you think you have a 60% chance of winning a bet but the odds are 50/50, you have a 10% edge. Bankroll: The total amount of money that you have set aside for betting and are comfortable risking. Betting unit: A percentage of your bankroll, typically 1-2 %, that you use as a standard wager. Flat Betting: Risking the same number of betting units on every game. Line Movement: When the odds change on a game. This can be due to an injury, suspension or other news affecting a team, or simply because oddsmakers are trying to balance the betting. Reverse Line Movement: When a high percentage of people are betting on one team, but the line moves the other way. This indicates the big (sharp) money must be betting opposite the majority of people. Cover: When a team ‘beats’ the betting line. If a -1.5 favourite wins by 2 goals or a +1.5 underdog loses by 1 goal, they have covered the puck line (spread). Push: When the final score lands on the betting line, resulting in neither team covering (or the game neither going over or under). If your bet pushes, your money is refunded. Proline: Common name for Canadian provincial sports lotteries that requires you to pick the results of several different games and to be right on all of them to win. Other provincial sports lotteries are Mise-O-Jeu, Sports Action and Sports Select. Limit: The maximum amount a sportsbook will accept on an individual wager. Online sportsbooks will usually accept bets of thousands of dollars, while Proline and provincial sports lotteries typically limit players to $100 per ticket. Against the Spread: Measuring a team’s record against the betting line (puck line) instead of in wins and losses. Bad Beat: When a bet that should have won, doesn’t. Like taking the under 5.5 in a hockey game and it’s 3-2 with 10 seconds left, then losing on an empty netter. Steam: When the betting line moves suddenly and sharply in a certain direction, usually an indication of big money coming in on a certain side or result. Juice/Vigorish/Vig: The commission a sportsbook charges on a wager, which is included in the betting line. Value: The edge you have on a wager. If an underdog is paying much more than you think it should, the underdog has value.